This themed activity would have been the perfect professional learning event to implement during the recent Olympic games. We actually did it just a couple of weeks ago with a group of our teachers. If you find it useful, you could use it now or wait until 2020 when the next summer Olympics will happen in Tokyo. 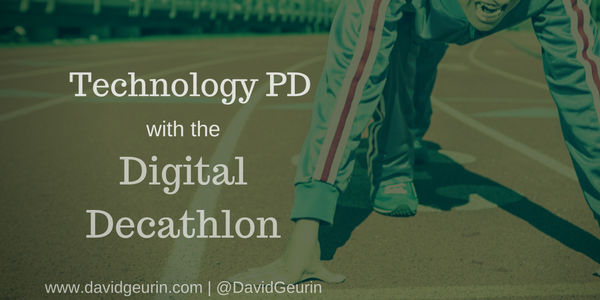 The Digital Decathlon is a self-directed learning activity to help teachers sharpen their tech skills. We built this thing from scratch and think you could probably make it even better. Feel free to use what we've created or adapt it to fit your needs. Several teachers in our building contributed to the final product. I will give them a personal "shout out" a little later in the post. -Work in pairs or small groups to accomplish the tasks. -Choose 10 'events' to complete the Decathlon. We had 15 challenges to choose from. -Create a visual representation of each challenge to include in a Google Slides presentation. Since we pushed this out as an assignment on Google Classroom, every teacher automatically had a copy of the Slides presentation to work with. We allowed a couple of hours to complete the activities, and we had a couple of our most tech savvy teachers on hand to provide support as it was needed. We felt this was a better way to learn than simply having someone do a step-by-step training on a particular topic. There are more choices in this approach, so it has the potential to meet more needs. And it relies on an inquiry-based approach. Learners have to point and click and figure some things out on their own. It's been my experience that people who learn tech most effectively are willing to take risks and just try different things to solve problems and figure out the tool. This activity encourages this type of learning. If you decide to do something like this with your team, it's a good idea to spend some time on the front end explaining the process and maybe even modeling one of the tasks. At the end, have a time of sharing and reflecting on what was learned. Thanks to Gina Green (@BHSBizDept), Ashley Clift (@MRS_CLIFT), Tania Driskill (@TaniaDriskill), and Ashley DeVore (@AshleyDeVoreFCS) for contributing to the tech challenges included in the Digital Decathlon. These teachers are some of our tech mavens at Bolivar High School. Question: What ideas do you have for creating your own Digital Decathlon? How could this be even better? I want to hear from you. Share a comment below or respond on Facebook or Twitter. Are You Showing Up Well For Your Students?